Carefully tailor-made clothing seems largely a thing of the past, now reserved for exclusive runways imposing some designer’s idea of haute couture. But with 3D printers holding the promise of everything from customized prosthetics to affordable pharmaceuticals genetically tailored for each individual — all of which could be potentially printed at home — imagine being able to print a custom-made, fluid garment that is already pre-assembled, on your desktop. Will we be printing comfortable, customized, no-assembly-required clothing at home in the near future? Somerville, Massachussetts-based design studio Nervous System is one forerunner in this new development of what are called “4D printed” clothing that is dynamically generated, fully customizable and is self-assembled right off the printer — no stitching or manual assembly required. 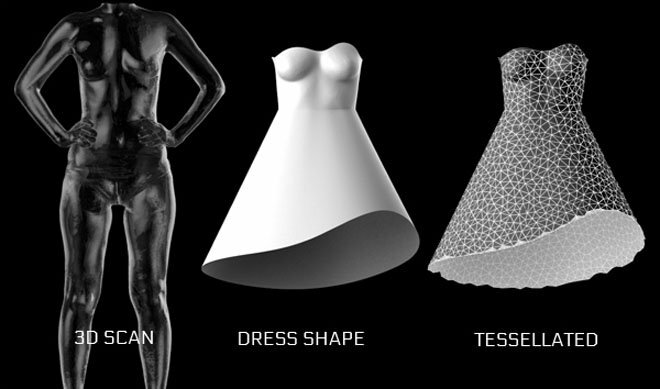 Nervous has dubbed their software for 4D printing Kinematics. 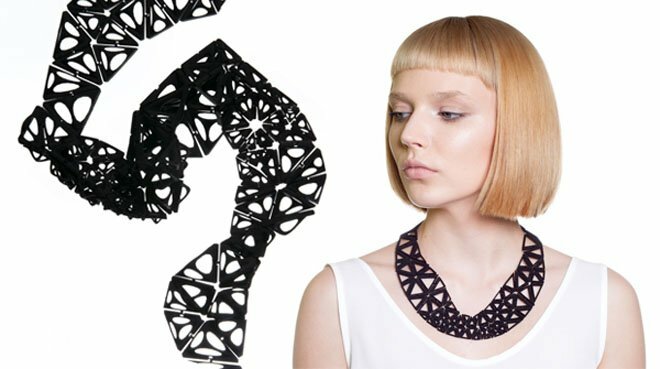 Inspired by origami-like, folding tessellations, it’s a system that “creates complex, foldable forms composed of articulated modules.” The technology isn’t perfect, but it’s come a long way from earlier 3D printed clothing that seemed more fit for the runways than everyday wear. It’s only recently that multi-material and multi-colored 3D printing has permitted designers to experiment more, and to move away from rigid white plastics that characterize many previous designs. The next step for designers is to explore how 3D printed clothing can move more naturally, and be printed more efficiently, as many of the custom pieces that you see paraded on the catwalk surprisingly require many hours of laborious assembly by hand. 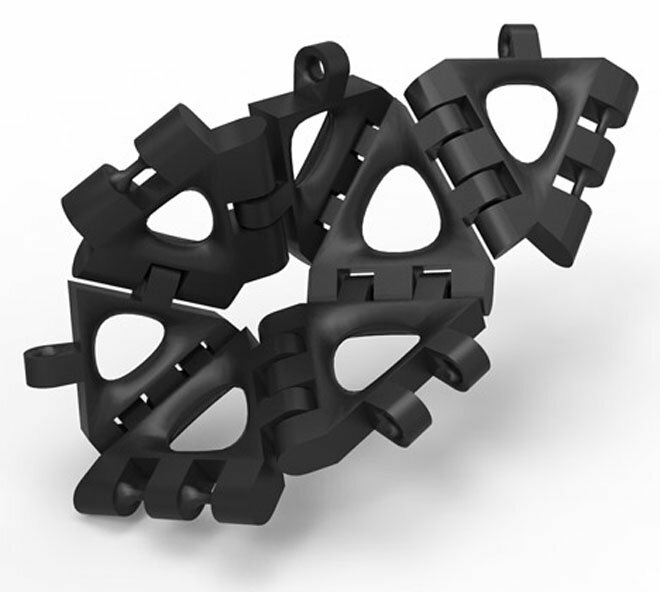 Kinematics produces designs composed of 10’s to 1000’s of unique components that interlock to construct dynamic, mechanical structures. 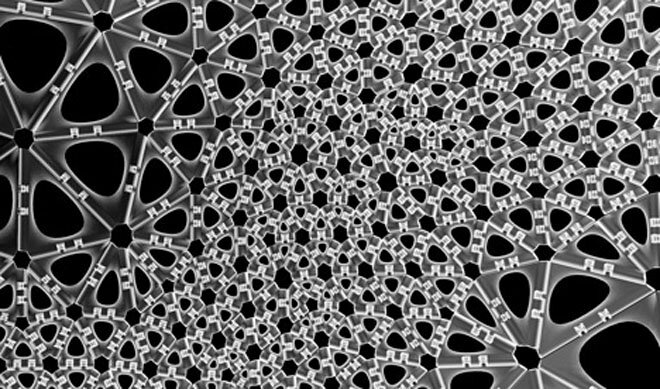 Each component is rigid, but in aggregate they behave as a continuous fabric. Though made of many distinct pieces, these designs require no assembly. Instead the hinge mechanisms are 3D printed in-place and work straight out of the machine. It’s almost like a suit of 3D printed chain mail, that has been magically pre-assembled by computation, and unearthed archaeologically from a monolithic block of powdery material. That’s as far from the sense of conventional fashion as one can get. 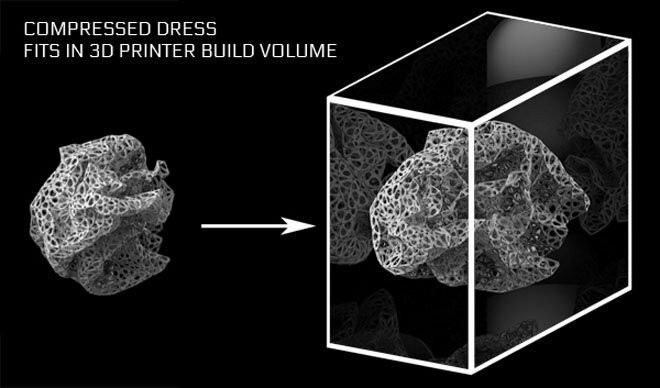 But Nervous Systems’ move into self-assembling 4D printed clothing arose from a peculiar set of circumstances, beginning began back in 2012 as a collaborative effort with Motorola. The telecommunications company asked Nervous System’s founders Jessica Rosenkrantz and Jesse Louis-Rosenberg to create an application for one of their new cellular phones that would allow users to create and print customized objects in under an hour, using a low-cost 3D printer that the company would be taking on tour, in a van, around the United States. Realizing the immense possibilities of this framework, Rosenkrantz and Louis-Rosenberg then moved on to refine the software and combine it with 3D body scanning to produce larger, more complex and individualized items, such as a bodice and finally a full-sized, freeform dress that actually looks comfortable enough to wear for the day. To her credit, Rosenkrantz personally tests each product by wearing it for hours on end to further refine each design. The most exciting thing about switching from extrusion-based to powder-based printing was that we could now design objects that were not self supporting. Though Kinematics was originally developed to print three dimensional objects flat, allowing objects to be anywhere in space opened up new possibilities. [..] These structures can then be digitally folded into more compressed shapes enabling the construction of objects much larger than the 3D printer’s build volume. 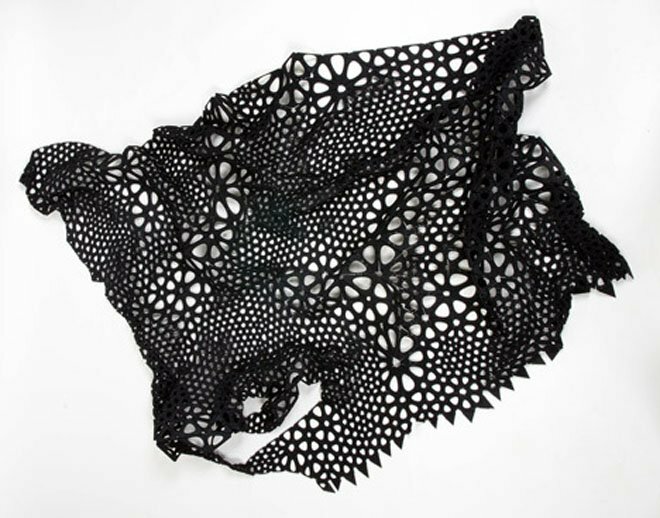 A first version of the Kinematics dress consisted of 2,279 unique triangular panels interconnected by 3,316 hinges, all 3D fabricated as a uniform structure of nylon by Shapeways of New York. Created in the web-based app Kinematics Cloth (which also allows users to customize shirts and skirts), this one-of-a-kind garment was recently acquired by the Museum of Modern Art, giving us an idea of how momentous this development might potentially be for 21st-century fashion. Imagine: no more textile waste, no more sweatshops, no more ill-fitting clothes. It may mean the decline of handmade clothes, but it could be the future of fashion, dematerialized. 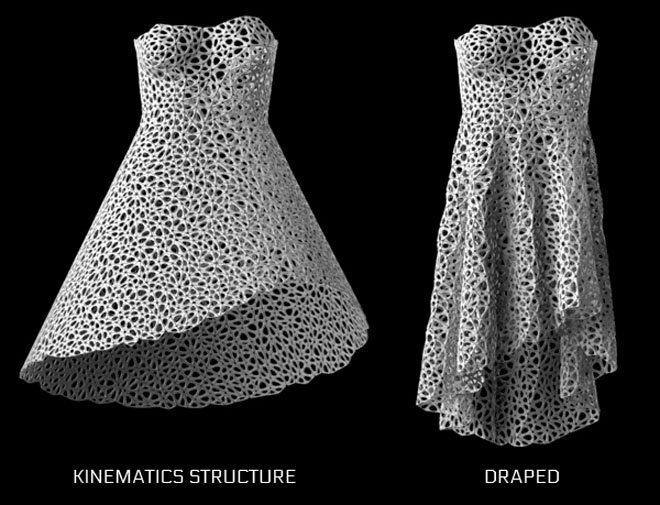 Of course, there are still some things to tweak: the Kinematics dress took a full 48 hours and USD $3,000 to print, meaning that it’s not quite ready to be commercialized. It’s not exactly the fashion we are used to, but what is fashion in any case but a constant reframing of what is perceived as avant-garde into the commonplace and customary?